Convoy, a two-year-old Seattle company, makes software that matches nearby and available truckers to a shipping job. Convoy said July 25 it raised a new round of funding from Bill Gates’s Cascade Investment and other backers. Gates joins Amazon.com Inc.’s Bezos, who invested earlier. The latest financing totals $62 million. The investment won’t break the bank for Gates or Bezos, whose fortunes are within $3 billion of each other, according to the Bloomberg Billionaires Index. But Convoy has become a hot startup investment among fellow billionaires. Salesforce.com Inc. CEO Marc Benioff and KKR & Co. co-CEO Henry Kravis are also shareholders. IAC/InterActiveCorp. Chairman Barry Diller participated in the new round with Gates. Convoy was initially pitched as an “Uber for trucking” and has raised $80 million in total since starting in 2015. But this year, Uber rolled out its own version of on-demand trucking. The service, called Uber Freight, connects truck drivers with long-haul assignments. There are other providers, such as Trucker Path, but Uber’s financial heft—having raised more than $15 billion since its inception—makes it a force. That’s despite distractions posed by a lawsuit claiming a former Uber executive, who was working on autonomous trucking technology, conspired with the company to steal trade secrets from Alphabet Inc.’s Waymo. Uber denies wrongdoing. Uber said its two-month-old freight service has been greeted by enthusiasm. “We’ve learned an incredible amount already and are continuing to recruit the top minds in the industry as we ramp up our investment in this technology,” a spokeswoman wrote in an email. Lewis said Convoy is fulfilling thousands of shipments and generating millions in sales a week. He said sales volume is doubling every quarter but declined to provide figures. Consumer giants Unilever and Anheuser-Busch InBev SA have signed on as customers. Convoy initially required pickups to originate in the Pacific Northwest and has since expanded to several other regions. It plans to use the new funds to go further, with operations in the Northeast, Mid-Atlantic and the South over the next year. Funds will also go toward software development. Lewis declined to comment on Convoy’s valuation. The new funding was led by Y Combinator’s Continuity Fund. It’s the first time the Silicon Valley firm has invested in a company that wasn’t incubated in its startup program. (Willett Advisors, the investment arm for the personal and philanthropic assets of Michael Bloomberg, the founder and majority owner of Bloomberg LP, invests in Y Combinator startups.) “The market opportunity is huge, and trucking is a space that has not had any innovation in two decades,” said Anu Hariharan, a partner at the Y Combinator venture fund. The U.S. trucking market is worth about $800 billion, and it’s rife with inefficiency. Lewis said trucks are driving without cargo more than 30% of the time, often after returning from a drop-off. He positions his company as a way to cut costs and pollution, a proposition that’s attracted not just marquee investors but also a number of competitors. Some have already become road kill. 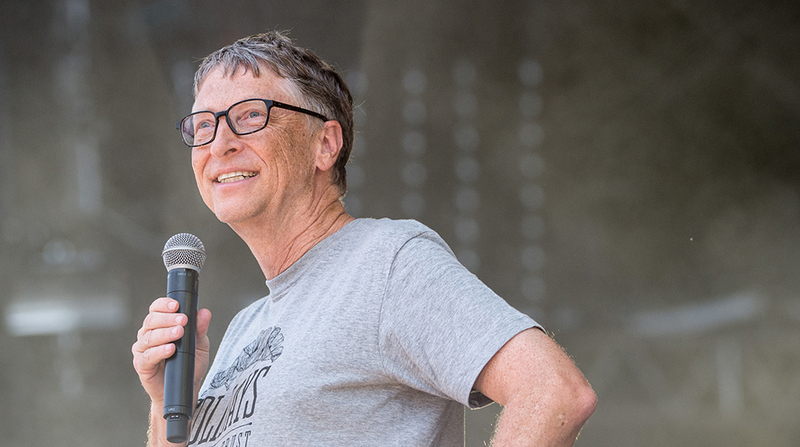 Trucking, even the software-enabled variety, may seem like an antiquated industry for a tech leader like Gates, but the world’s richest man often leans toward investments in more traditional industries like rail, trash and tractors. He’s the biggest single investor in Canadian National Railway Co. and Deere & Co. A spokesman for Gates’s investment firm said Convoy’s promises to reduce road congestion and help the environment were major draws.